carved in the round in a naïve provincial style, the Buddha Amitabha shown seated with legs crossed in dhyanasana as if on a cushion, with the forward corners compressed by his bare feet, his hands folded and resting in his lap, with long fingers entwined, with a benevolent expression on his face, his elongated narrow eyes half-closed under prominent arched eyebrows, and a ‘mystical smile’ on his lips, his ears of exaggerated size carved flat and plain with long lobes, a large domed usnisa on top of his head, wearing simple robes carved with an all-over pebbled surface except for the narrow crossed lapels, the brick-red sandstone showing widely scattered traces of white and pale reddish-tan pigment, especially on the face and arms, with remains of light green pigment in several places on the robes. 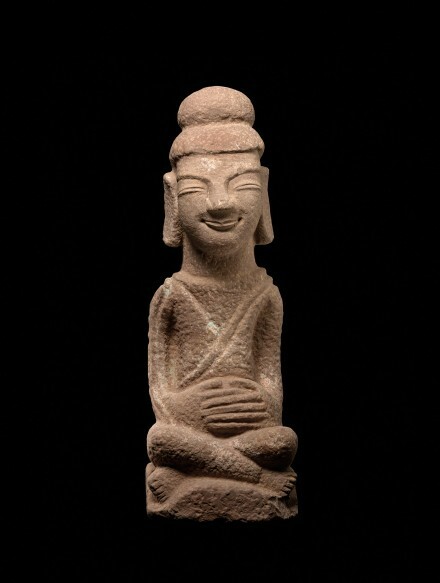 Compare the relief figure of the Buddha shown seated in a niche, carved from similar coarse reddish sandstone in a naïve provincial style, exhibited at the National Museum of History, Taiwan, and illustrated in the catalogue entitled The Splendour of Buddhist Statuaries: Buddhist Stone Carvings in the Northern Dynasties, Taipei, 1997, pp. 70-71, no. 2.